Carbine styled Stryker marker. Fully loaded Tippmann Stryker marker. What is different between the Stryker models and which is best for me? Versions - What is unique about the Stryker line is the amount of pre-assembled versions that are available. The platform is the same for the four options; however the attachments (or accessories) are where they differ. AR1 Elite – The AR1 Elite is the fully loaded Stryker. It comes with an Apex 2 barrel system, a Rip-Clip loader, flip up sights, quad rail shroud, and a collapsible shoulder stock. It is styled around a traditional AR platform. MP2 Elite – The MP2 has a sub machine gun styled shroud. It also comes with flip up sights, Rip-Clip loader system, collapsible stock, and the Apex 2 barrel. XR1 – Comes standard with a collapsible shoulder stock and an AR Styled Shroud. MP1 – The most compact Stryker. It has a shorter sub machine gun styled shroud and a folding stock. 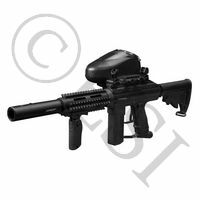 If you are a fan of CQC (close quarter combat) then the MP1 is right for you. Stocks - The different styles of shoulder stocks and why it matters. Collapsible – The Stryker's collapsible stock (aka telescoping stock) is adjustable to six different horizontal positions. This gives the user the ability to extend or shorten the distance between their shoulder stock and rear grip, letting them choose what is most comfortable for their situation. Folding – The function of a folding stock is self-explanatory, they can be folded to the side of the marker. This feature however is a great one for players who enjoy engaging in close battles. Sometimes a shoulder stock is not appropriate for use when clearing rooms and bunkers. In this situation you would be able to fold the stock to the side and shorten your shooting platform, making it easy to maneuver around corners. Barrels - All the Tippmann Strykers use Autococker threaded barrels. Apex 2 – The Apex 2 is a premium barrel system. It is very unique in the sense that it can actually put spin on the paintballs as they are shot from the barrel. This gives paintballs shot from the Apex 2 a curving effect. This curving effect allows you to actually bend your shots and hit players that are hidden. You can of course adjust which direction the barrel will curve the paintballs, as well as how much curve the shot will have to it. Aluminum Ported Barrel – These are stock barrels that while they do not have many features, they are a solid starting barrel. The porting makes your shots harder for your opponents to hear, and its aluminum construction can withstand the abuse of paintball. Shroud - The shroud is the piece that covers the barrel and gives the Stryker its realistic look. Realistic Styled Shrouds – All of the Strykers comes with a unique shroud that gives the marker its realistic look. The MP2 Elite, MP1, and XR1 have shrouds that are purely for looks. Quad Rail – However the AR1 Elite shroud while looking realistic also does have an advantage over the other versions. This shroud is actually also a quad rail, meaning it has all picatinny rails on all four sides of the shroud. These rails will be used if you plan on adding tactical accessories to your marker such as: red dots, scopes, flashlights, lasers, and/or a bipod. Rip-Clip Loader System - The Rip-Clip comes with the AR1 Elite and the MP2 Elite. The Rip-Clip loader is a great addition to any Stryker. Due to the Strykers having electronic boards and being capable of firing 10+ BPS (balls per second) a gravity fed hopper simply can not keep up. The Rip Clip uses technology from one of the great electronic loaders of the past, the VLocity. With the Rip Clips installed you will be able to shoot at extreme rates of fire with no jams or skipped shots. The Strykers Rip Clip mounts to the right side of the marker so that it does not obstruct you sight line. It can be serviced without any tools. What features are the same throughout the Stryker line? The Stryker platform is completely pneumatic, meaning it uses air power to fire. They are only capable of using HPA (High Pressure Air) and Co2 should NEVER be used in a Stryker. The spool valve is a new to most Tippmann fans, but has been used in many other high end guns for years. Its low operating pressure is the big contributing factor to the Stryker's buttery smooth shot quality. Spool valves also are excellent at keeping the marker quiet when firing, making stealth moves more of a possibility. Electronic Board - Strykers come with an electronic board that is powered by a 9 volt battery. This board is programmable and features four different firing modes. Strykers come with an electronic board that is powered by a 9 volt battery. This board is programmable and features four different firing modes. Programming is not a complicated or long task due to the Stryker's LED visual setting indicator. 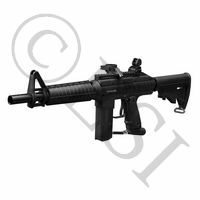 Semi-Automatic - Each trigger pull will result in one paintball being fired. The trigger must then be fully released & pulled again before the marker will shoot another ball. Burst Mode - This mode will make the Stryker capable of firing a burst of paintballs each time the trigger is pulled. This burst can be adjusted from 2-6 shots per trigger pull. Ramping - Ramping is the mode mostly used by tournament speedball players. It is similar to burst however rather than shooting a specified amount of paintball shots per trigger pull, ramping requires you to reach a certain ROF (Rate of Fire) at which time the electronics will "ramp" up your ROF to your desired BPS (balls per second). Fully Automatic - Fully automatic will require the user to reach a certain ROF before it allows the fully automatic to kick in. Once it goes fully automatic you can hold the trigger down and the marker will continue to fire until you release the trigger. Break beam eyes are a life saver as they prevent the marker from chopping paintballs. A chop is when a paintball is fired even though the ball is not fully loaded in the breach. It is essentially half loaded and when the markers bolt fires & comes into contact with it, it breaks the ball instead of sending the ball down the barrel. Chopping is infuriating because it gets paint all over your breach, down you barrel, and in the worse cases it shoots paint back up into your hopper. You then need to fully clean your marker, loader, and barrel before it will return to normal operation & accuracy. Break beam eyes are a two pronged sensor that is installed into both sides of the Stryker's breach. When the break beam sensor is obstructed it is sensing that there is a paintball in the breach, and allows the marker to fire. When the sensor can see its other half the eyes can see there is no ball in the breach and the marker will not fire. Upgrades - All Stryker models come with a picatinny rail on the top of the marker that runs the entire length of the markers body. The AR1 additionally features a picatinny quad rail on its shroud. Tactical Upgrades - Tactical upgrades can be added to the exterior of the marker. Some examples of tactical upgrades are sights, scopes, slings, lasers, and flashlights. Most of these attachments are attached using picatinny rails, which can be found on the top of every Tippmann Stryker. They are easy to install and remove and will not only help you perform better, but also make you look much more intimidating. Maintenance - Accessible firing engine for easy and quick cleaning. It should be stated that due to the Stryker's spool valve design it is going to require more maintenance than previous Tippmanns. You should really aim to re-lube (not oil) your bolt system every 1-2 times you use the marker; this will keep your Stryker running in tip top shape for years. The Stryker does have an easy access firing engine designed to not overwhelm newer players who need to maintain their marker.